The high-profile capture of Joaquin “El Chapo” Guzmán Loera, the leader of Mexico's ruthless Sinaloa drug cartel, should not stoke immediate fears of unrest on Texas' southern border, analysts said Saturday. 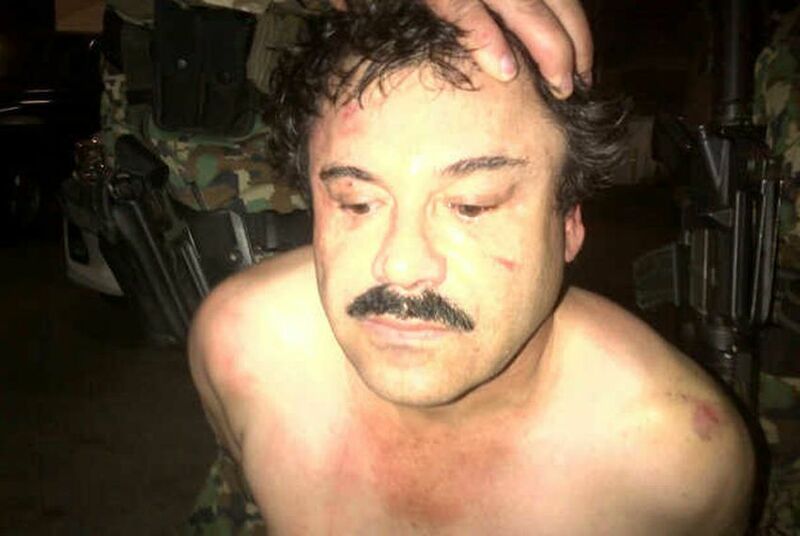 A picture of Sinaloa drug cartel leader Joaquín "El Chapo" Guzmán Loera is released by Mexican law enforcement officials in February 2014 after Guzmán was captured. But they cautioned that only time will tell if Guzmán’s arrest means that the rival Juárez cartel will try to retake the Ciudad Juárez turf it lost in 2008, when the Sinaloa swept in and turned the drug shipment region that touches Mexico's border with El Paso into a killing field. The drug war there has claimed more than 10,000 lives since then. Guzmán, one of the most wanted men in Mexico, who was also sought by U.S. authorities, was captured early Saturday morning in Mazatlán. His arrest comes nearly 13 years after escaping from the Puente Grande prison in the Mexican state of Jalisco. The capture occurred at 6:40 in the morning and was confirmed Saturday afternoon by Lic. Jesús Murillo Karam, the Mexican attorney general, who said the government was 100 percent certain that the man it would soon parade in front of cameras was Guzmán. Howard Campbell, author of the book Drug War Zone and an anthropology professor at the University of Texas at El Paso who specializes in drug trafficking and border culture, said Guzmán’s capture, though significant, should not dramatically alter life in Juárez. Guzmán is said to have controlled the drug shipment region that includes the Mexican state of Chihuahua and runs northward into the United States since the years-long war with his former allies in the Juárez cartel. Guzmán, a former peasant laborer who decades later was listed as one of the world’s richest men by Forbes magazine, made agreements in Juárez, Campbell said. Those will likely be honored. Phil Jordan, the former director of the El Paso Intelligence Center, who was also a senior inspector with the Drug Enforcement Administration, said what happens on the border could hinge on when, or even if, Guzmán is extradited to the United States to face multiple charges here. Jordan said the arrest takes Guzmán out of the drug game — for now. But he cautioned that Guzmán has escaped before. And he referenced the July 2013 release by Mexican officials of Rafael Caro Quintero, a legendary drug kingpin in Mexico who was allegedly involved in the murder of Drug Enforcement Administration agent Enrique “Kiki” Camarena, whom Jordan knew well. Caro Quintero was an associate of Guzmán’s in the Sinaloan boss’ early years. David Ramirez, a former U.S. Border Patrol agent who retired as an assistant special agent in charge at the U.S. Department of Homeland Security and served in the U.S. Embassy in Mexico, sees things differently. "Even if he gets extradited, it will be business as usual," said Ramirez, an El Paso native. "I don't see any other groups taking a run at the Sinaloa cartel." The arrest marks the latest in a series of major accomplishments by the administration of Mexican President Enrique Peña Nieto. The president is a member of the Institutional Revolutionary Party, which ran Mexico for more than 70 years before the rival National Action Party took the helm in 2000. Peña Nieto said initially that he would concentrate less on capturing high-level capos and instead focus on fighting street crime and advancing reforms within the country’s judicial and law enforcement agencies. But since taking office in December 2012, Peña Nieto’s administration has also overseen the capture of Miguel Treviño Morales, the alleged leader of the Zetas cartel, which battled Guzmán’s group for control of the drug shipment region that includes the Mexican states of Nuevo Leon and Tamaulipas, which border Texas' Webb County. On Saturday, Peña Nieto posted several congratulatory tweets on Twitter, promoting his administration’s latest coup. But not all are sold. Ramirez said observers need to look beyond the headlines and acknowledge the complicit role of the United States in Mexico's drug war. Campbell was also hesitant to heap praise on Mexico's president. Campbell added that Saturday’s events could have been in the works for some time. “In Mexico, when things like this happen, it’s not by chance. It’s because the political timing is right for it to happen,” he said.